A serene hill station Kausani is famous for its unbeatable splendid views of snow covered mountains. Hotel Grand National is a well budget property in Kausani offering best staying option with comfortable accommodation. Distance views of peaceful hilly mounatins and a healthy atmosphere of Grand National hotel makes it one of the best hotel in Kausani for travellers. With elegant accommodation, guests can enjoy the authentic Kumaoni food with family at the hotel. Many places to attraction in Kausani are located close to the hotel such as Gandhi Ashram, Rudradhari Waterfall, Sarla Ashram, Kausani Tea State, Sumitra Nandan Pant Gallery etc. One can also plan excursions to Places like Bageshwar (38 Kms) and Binsar (48 Kms). Ranikhet is at a distance of 76 Kms, Nainital at a distance of 119 Kms and Mukteshwar at a distance of 123 Kms. 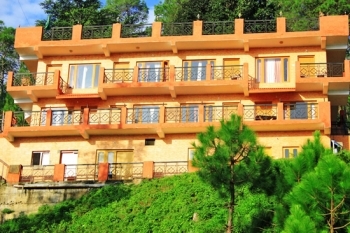 Hotel Grand National is located near View Point on TRC road at Kausani, Uttarakhand. Famous View Point is at few steps from the hotel. 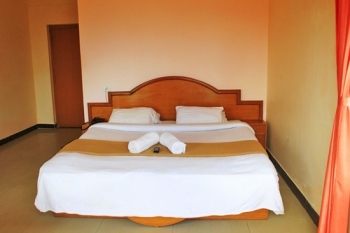 The hotel offers well appointed rooms divided in categories like Deluxe and Super Deluxe rooms with modern amenities like Cable TV, table, chairs, etc. Enjoy mouth-watering authentic meals at the in house multi cuisine restaurant of the hotel. Special Kumaoni dishes are available on requests. - TV with cable connection, Telephone, Attached bathrooms with geyser, Assistance for travelling, Trekking etc. - Children 6 to 12 years will be charged 25% of package and Adults 35% of the package. - Child below 5 yrs is complimentary. - Child (5 to 7 yrs) 25% of the package cost. By Air: Nearest domestic airport to reach Kausani is Pantnagar Airport at a distance of 162 Kms. Flights are available for Pantnagar from Delhi. Remaining journey can be covered by taking a Taxi which is easily available. Nearest International Airport is IGI Delhi. Tourists from other countries can board a flight to IGI Delhi from their country and then a flight to Pantnagar. By Train: Nearest Railhead to Kausani is Kathgodam at a distance of 132 Kms.You can board trains to Kathgodam from different part of country. Bagh Express, Ranikhet Express, Dehradun Kathgodam Express, GaribRath etc are some traind to Kathgodam. By Road: To reach Kausani, visitors can board buses for Almora or Kathgodam. Buses to these places are easily available from Dehradun, Delhi etc. From Kathgodam or Almora, they can hire a cab. The cab will be easily available at affordable rates. They can enjoy the scenic beauty of beautiful mountain ranges on way to Kausani. Visitors can directly book a taxi from Delhi and reach Kausani via Moradabad, Kashipur, Ramnagar , Ranikhet and Almora. The journey will take around 7 hours.